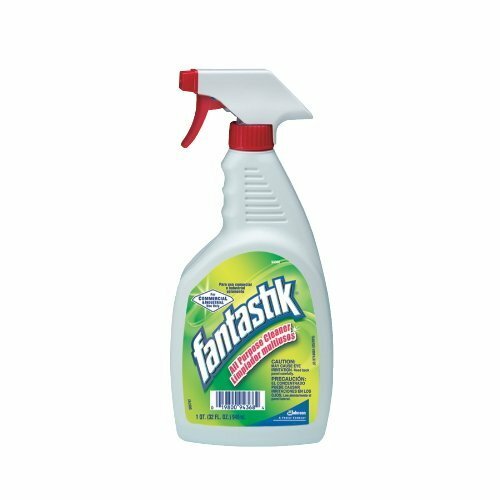 Take care of smudges, grit, and grime with Fantastik All Purpose Cleaner with Cap and Trigger. Watch as the powerful formula removes grease, scuff marks, smoke film, fingerprints, and other stubborn grime from a wide variety of surfaces throughout the kitchen. This versatile solution provides you with an excellent way to clean nearly any washable surface including walls, appliances, and bathroom fixtures, as well as many materials like ceramic, porcelain, stainless steel, chrome, painted woodwork, and more. As easy to use as it is versatile, applying this ready-to-use cleaner couldn't be any simpler. Just spray the soiled surface and wipe with a dry paper towel or lint-free cloth; no scrubbing or rinsing required. Eliminate stubborn grease and grime without leaving a smeared residue with this convenient, ready-to-use cleaner. Watch as the powerful formula removes grease, scuff marks, smoke film, fingerprints, and other stubborn grime from a wide variety of surfaces throughout the kitchen. This versatile solution provides you with an excellent way to clean nearly any washable surface including walls, appliances, and bathroom fixtures, as well as many materials like ceramic, porcelain, stainless steel, chrome, painted woodwork, and more. As easy to use as it is versatile, applying this ready-to-use cleaner couldn't be any simpler. Just spray the soiled surface and wipe with a dry paper towel or lint-free cloth; no scrubbing or rinsing required. Eliminate stubborn grease and grime without leaving a smeared residue with this convenient, ready-to-use cleaner. If you have any questions about this product by Fantastik, contact us by completing and submitting the form below. If you are looking for a specif part number, please include it with your message.